This post presents an examination of the relationship between religious belief, religious participation and age. Recent (2018) research by PEW compared the religious beliefs and practices of 18-39 year olds with those aged 40 and over. 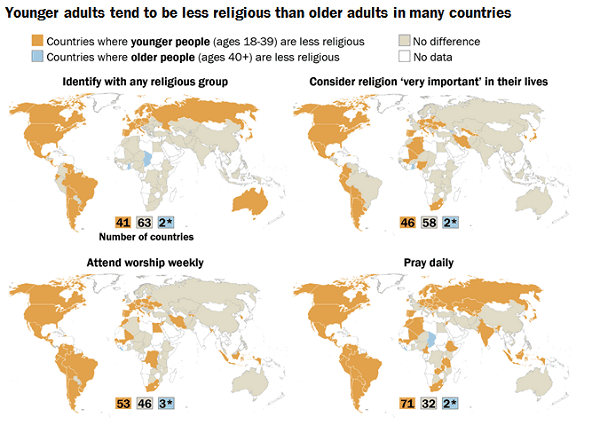 They found that younger people are less religious than old people in 41 countries, but there are only 2 countries in which younger people are more religious. There is no difference in 60 countries. Those aged 65+ made up 16.5% of the population as a whole, but just 5.6% of those reporting they had no religion. Also according to the UK National Census, ethnic minority religions tend to have a much younger age profile than Christianity or No religion. For example, 85% of Muslims are aged under 50, compared to around 55% of Christians. Eileen Barker’s research into The Moonies (a world rejecting sect) found that the membership base was relatively young, with most members being aged between 18-30. The New Age Movement tends to be made up of middle aged people, especially those in their late 30s and 40s. The relationship between social class and religion is not straightforward: the middle classes are, in general, more likely to attend church, but they are also less likely to believe in God and more likely to be atheists and join both world affirming and world rejecting NRMs. The working classes are less likely to attend church, yet more likely to believe in God than the middle classes. There are also certain denominations and even sects which might appeal specifically to the working classes: such as Methodism, for example. A 2015 YouGov survey of 7000 adults found that 62% of regular church goers were middle class and 38% working class. The same 2015 survey found that twice as many married working class men had never attended church compared to middle class men (17% compared to 9%). Voas and Watt (2014) conducted research on behalf of the Church of England and made three observations not directly about social class, but relevant to it. Firstly, church attendance is higher in rural areas compared to urban areas. Secondly, church attendance is higher in the South of England compared to the North. Thirdly, they noted growth in church attendance in areas which had high performing church primary and secondary schools. All of these indicators suggest higher church attendance in middle class compared to working class areas. Ashworth and Farthing (2007) found that, for both sexes, those in middle class jobs had above average levels of church attendance. Conversely, those in skilled, semi-skilled and unskilled working class jobs had below average church attendance. Welfare recipients had the lowest levels of church attendance. A 2016 YouGov Survey revealed that 48% of those in social grades ABC1 described themselves as ‘Atheist’ compared to 42% of those in social grades C2ED. A 2013 review of >60 research studies on the relationship between IQ and religiosity found that people with higher IQs are more likely to be atheists. (High IQs are correlated with higher levels of education and higher social class). Lawes (2009) found that ‘lifelong theists’ disproportionately come from unskilled and semi-skilled manual backgrounds, and were less likely to have academic qualifications. Conversely, lifelong atheists disproportionately come from higher professional and managerial backgrounds, and are more likely to have experienced higher education. There is some evidence that those suffering deprivation (the lower social classes) are more likely to turn to religion….. Churches in deprived inner city areas tend to have higher rates of attendance. Methodist, Pentacostal and Baptist denominations tend to be more working class. Catholic Churches are more likely to attract Irish, Polish and African immigrants who have typically experienced higher levels of deprivation. As a general rule, the middle classes are more attracted to both World Affirming NRMs (and the New Age Movement), and World Rejecting NRMs, at least according to Eileen Barker’s classic study of ‘The Moonies’. Andrew Mckinnon notes that there has been a ‘dearth’ of research on the relationship between religion and social class, meaning there is something of a data gap. Because of the above, we are often stuck with relying on indicators which might not actually measure social class. Chapman et al, as well as the good ole’ t’internet. Secularization is the declining social significance of religion in society. The extent of secularization is usually ascertained (for the purposes of A-level sociology) by using three broad indicators: belonging, behaving, and belief, and there are numerous specific measures associated with each indicator. This post aims to provide brief revision notes on some of the contemporary evidence for secularization. Just 3% of those aged 18-24 described themselves as Anglican, compared to 40% of those aged 75 and over (1). 25.1% of the population reported having ‘no religion’, up from 14.8 per cent of the population in 2001. There was an increase in all other main religions. The number of Muslims increased the most from 3.0 per cent in 2001 to 4.8 per cent in 2011. NB – This final piece of evidence: the increasing reported popularity of all other religions besides Christianity cannot really be taken as evidence against secularization because the overall increase of all these other religions is smaller than the increase in the number of people reporting ‘no religion’ in the same period. It does, however, suggest increasing religious diversity. According to the Church of England’s own data (4), both church attendance and attendance at ‘hatching, matching and dispatching’ (baptism/ marriage/ funeral) ceremonies are falling. Usual Sunday attendance at Church of England churches in 2016 was 740,000 people (86% adults, 14% children under 16). There were 120,000 Church of England baptisms and services of thanksgiving for the gift of a child – representing 10% of live births. There were 45,000 Church of England marriages and services of prayer and dedication after civil marriages – just 20% of marriages. There were 139,000 Church of England-led funerals during 2016, 57% of which took place in churches and 43% at crematoria/cemeteries – 28% of funerals. The higher percentage probably reflects the greater proclivity for people near death to ‘find’ ‘comfort’ in ‘religion’. The church of England notes that most of its headline indicators show a decline of 10-15% over the last decade, since 2006. Religious belief is a notoriously subjective concept: while the statistics in the first section above suggest secularization is taking place, it is possible to declare that you belong to ‘no religion’ while still having religious beliefs, so we need to dig a little deeper into the exact nature of individuals’ spiritual beliefs in order to properly assess whether secularization is taking place. When we do this, most of the evidence suggests that secularization is occurring, although possibly not as quickly as the decline in support for traditional religion would suggests. A 2015 YouGov poll revealed that 33% of Britons ‘do not believe in God or a higher spiritual power’, up from 29% in 2012. The same poll revealed that younger people are more likely to not believe in any type of higher power compared to older people – only 25% of 18-24 year olds believe in God or some other kind of higher power compared to over 40% of over 60 year olds. Essay plan: evaluate the view that the extent of secularisation has been exaggerated. (1) British Social Attitudes Religion Survey, 2017. (2) The Guardian (2017) – More than Half the UK Population has No Religion, Finds Survey. (3) Office for National Statistics: Religion in England and Wales 2011. (4) Church of England Research and Statistics (2016) – Statistics for Mission 2016. 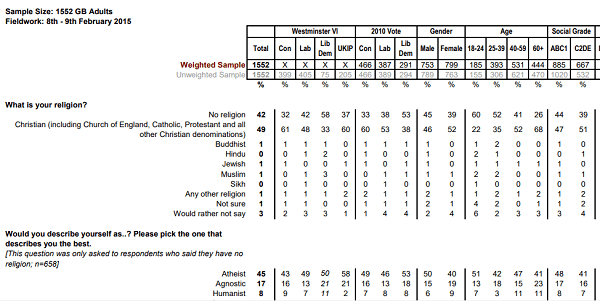 (6) YouGov Poll on religious belief, 2015.